Rolling Admissions! Start in the fall, spring, or summer! We see leadership potential in you. Take your career to the next level and apply to our certification program in K-12 Educational Leadership. 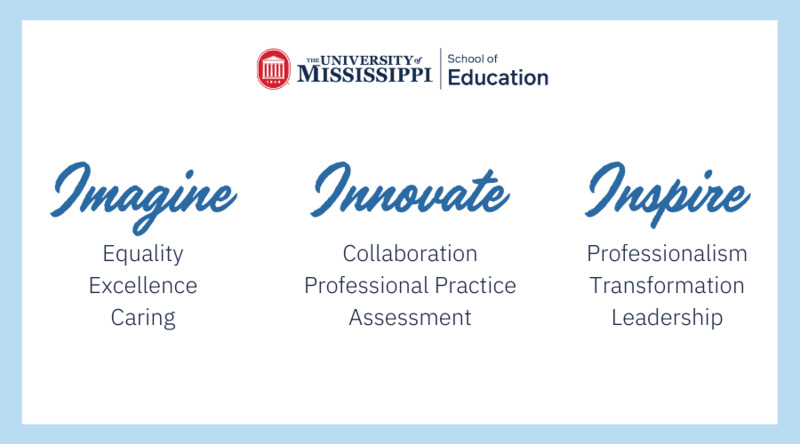 Our research-based program focuses on best practiced of effective school leaders and is designed to fit the demanding schedule of a full-time teacher. Our 30-hour program requires graduate students to complete two courses per semester. Degree candidates complete internship hours under one of our Instructional Leader Mentors. Yes. Contact our Graduate Studies Office for in-depth information. Teachers and administrators in districts which host UM student teachers may also qualify for bank hours to pay tuition. The program can be completed in 18 months. Our Online M.Ed./Ed.S. requires 30 credits and students typically take 2 classes each semester. Should I apply for a M.Ed. or Ed.S.? If you are a licensed teacher and you already hold a master's degree, then you are eligible to apply to our Specialist in Education (Ed.S.) option. Other applicants should apply for the Master of Education (M.Ed.) program. Both programs lead to an advance administrative license from the Mississippi Department of Education. How will my career change? A number of our graduates go on to take Assistant Principal positions after graduation. Other go on to administrative leadership positions at the school or district level. Many of our graduates become a full principal within just a few years of graduation. When can I work on classes? Our Online M.Ed./Ed.S. program is designed to fit your life. We believe you should study online and on your time. Applicants must fill out an application through UM's Graduate School.